Many thanks to Kathryn Stripling Byer for speaking and reading her poetry at Coffee with the Poets in Hayesville, NC today. The atmosphere was casual and comfortable in Crumpets Dessertery at Phillips and Lloyd Book Store in the historic little mountain town. Netwest members and others from the community filled the room. Kathryn answered questions, and then said she wanted to hear from the local poets who had brought poems to read at open mic. Mary Mike Keller hosted the session and gave each person a chance to share a poem with the Poet Laureate of North Carolina. Elizabeth Rybicki, owner of Phillips and Lloyd Books, served a delicious cake and candies all in Valentine's Day colors. We look forward to another great day of poetry in March, second Wednesday, at Coffee with the Poets when Janice Townley Moore and Nancy Simpson will read. Their poetry is published in a new anthology edited by Judith Kitchen and Ted Kooser. The theme of the book is Birds and Nancy asked everyone to bring poems about birds for open mic. Look for more details on Kathryn Byer's blog and on Nancy Simpson's site. A surprised Nancy Simpson was honored at the Celebration of Books and published authors and poets on Thursday evening, July 17. After a day at John C. Campbell Folk School where Nancy presented to the North Carolina Arts Council Board along with Kathryn Byer, she found herself acclaimed by award winning poets and recently published poets who began their writing in her classes at the Folk School, or in one of her many classes at Tri-County Community School. 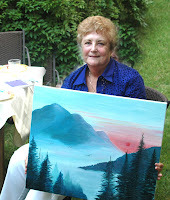 Glenda Barrett, whose chapbook, When the Sap Rises, was published by Finishing Line Press, brought a painting of mountains and Lake Chatuge that she had done for Nancy. Kathryn Byer, Poet Laureate of North Carolina and Debbie McGill, Literary Arts Director for the NC Arts Council spoke about when they first met Nancy. "I met Nancy when I came to read in Hayesville at the library when my daughter was a babe in my arms," Kay said. She went on to talk about her admiration of Nancy as a poet. She wanted us to realize that Nancy Simpson, while a wonderful teacher and leader, was first and foremost, a poet. 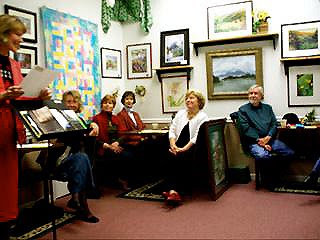 Debbie remembered how tenacious Nancy had been about Netwest and would not take "NO" for an answer when it came to getting what was needed for writers here in the rural mountains of North Carolina. Brenda Kay Ledford, award winning poet, spoke about her first class with Nancy and how so many of us who were present Thursday evening, met in Nancy's classes. Glenda Barrett and Mary Ricketson expressed gratitude for Nancy's encouragement to those of us who call her our mentor. Mother and daughter, Dorothea Spiegel and Linda Smith, both met Nancy in one of her classes. Dorothea is likely one of the best poets in the area. She is in her 80's now and still writes excellent poems. Netwest presented Nancy with a check to add to her computer fund. She is saving for a much-needed new Mac, and we want her to continue to write poetry and finish the historical novel she has begun. Also, she will need it for her work on the proposed new Netwest anthology she will be editing. There is no financial value we can put on the dedication and generosity Nancy devoted to NCWN West for thirteen years. Without her constant efforts to obtain funding, to maintain interest in all the counties represented, and keep mountain writers connected to each other and to Raleigh and Chapel Hill, we would not have continued as a program of NCWN.